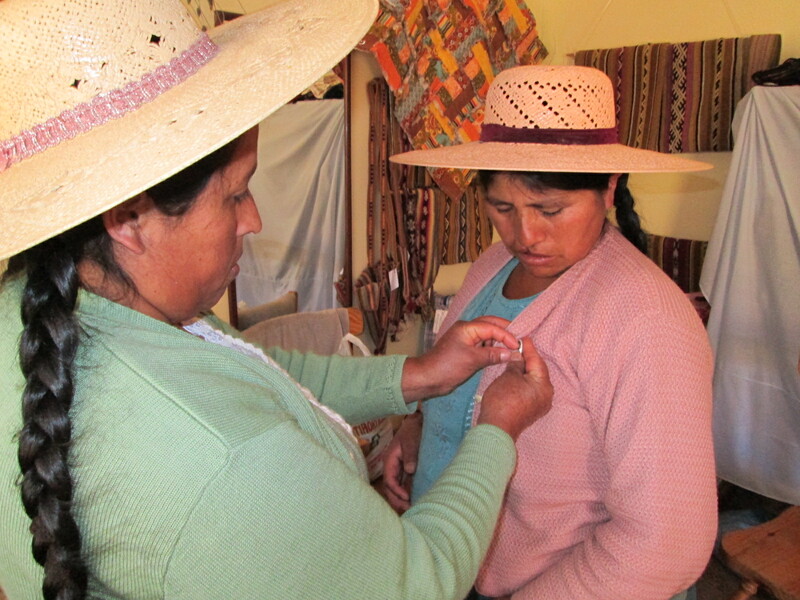 The women in the Club de Artesanas have spent the past few weeks finishing projects initiated by friend and volunteer Marian Leishman during her June visit. 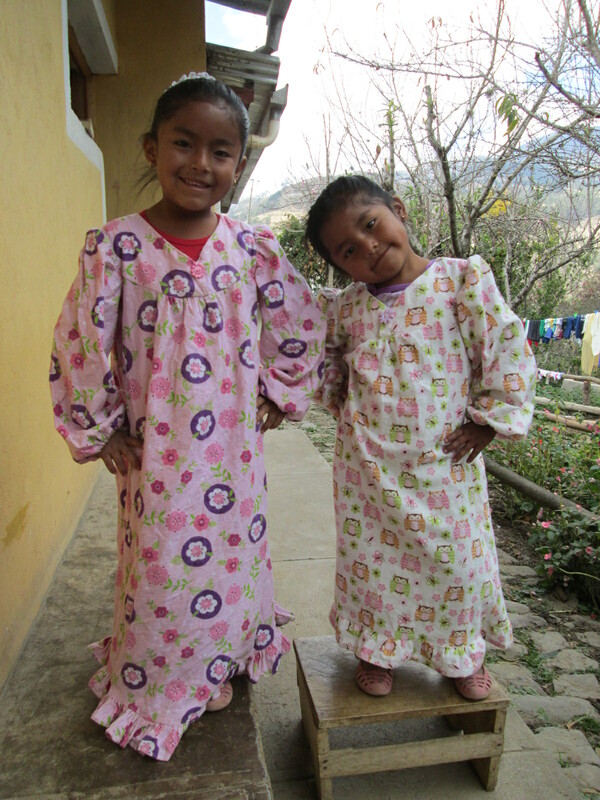 Although winter is waning the nights are still chill and young daughters can now snuggle up in warm flannel nightgowns. Doña Alberta was the first to finish the toe-up two at a time knitted socks. Vilma’s fingers have been flying as she made herself samples from, “The Granny Square Book” that Debora Petschek gifted the Club during her visit last month. 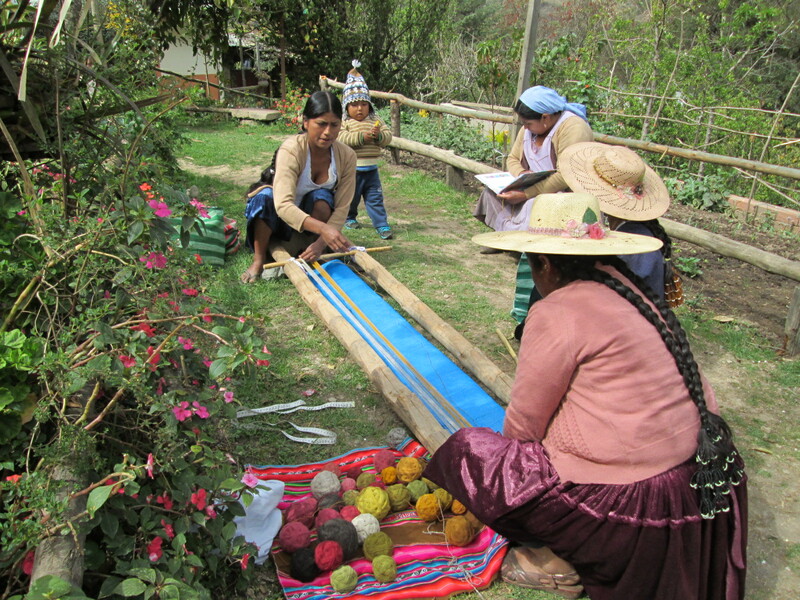 The women in the Club and from Huancarani have been working on two orders for weavings. 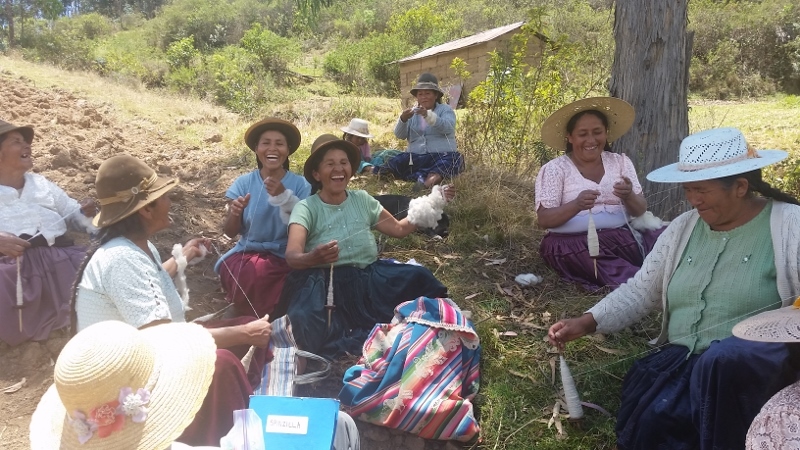 Doña Máxima has been helping weavers to warp during Club meetings because it takes two to toss the balls of yarn back and she has a great eye for color coordination. Amanda Smiles, founder of Ruraq Maki will be arriving later this month and ordered weavings to make samples for three new bag designs. The local cultural center ordered 20 ch’upsas (shoulder bags), but with less than a month´s notice the order will be almost impossible to fill. Each ch’uspa takes about 40 hours to complete and the Huancarani women are busy with potato harvest. Potatoes are harvested three times a year and remain an important Andean staple and cash crop. 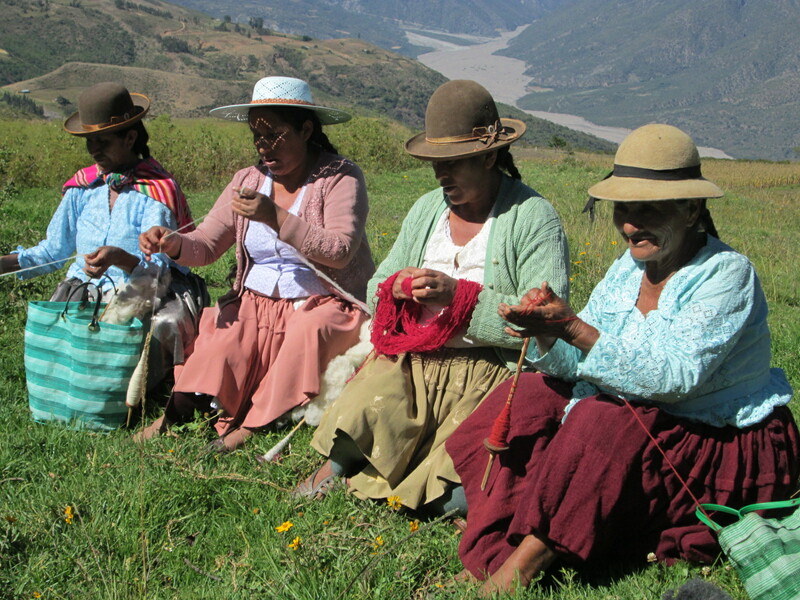 The majority of the Spinzilla team will be the weavers of the rural community of Huancarani. Spinzilla is an international hand spinning competition, and 56 teams with 25 participants each are registered to compete. The lengths of yarn spun between October 6th and 12th will be measured to determine the winning team. We will be visiting Huancarani on August 27th and should fill the last 8 vacancies to complete the Bolivian team. 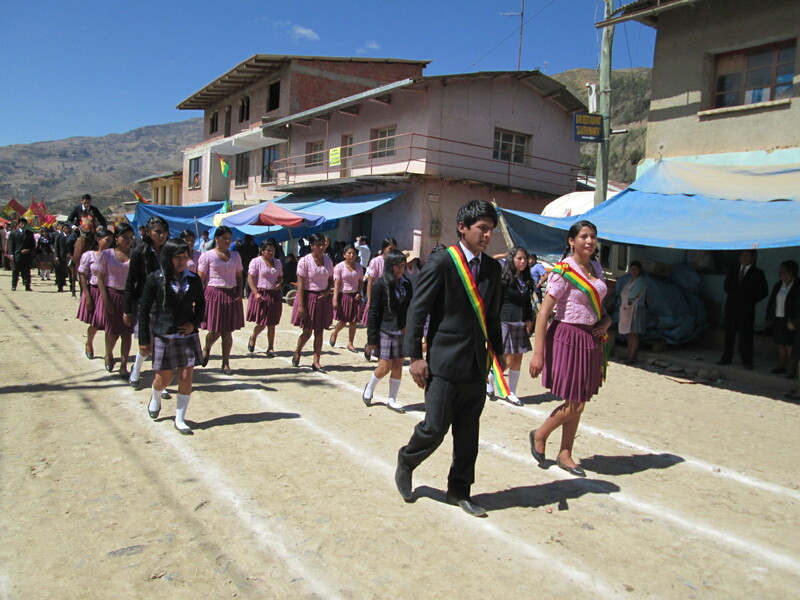 Elections take place in Bolivia every five years, and October 12th is national Election Day. All registered voters from Huancarani must come to Independencia to vote, so we will probably take the majority of measurements that day. The team participants will be submitting balls of yarn for measurement. They traditionally spin equal amounts of yarn on 2 pushkas (drop spindles) then pair the spun strands by balancing a pushka between the big toe and its neighbor on each foot and wind the paired strands off the phuskas into a ball. It looks easy, but to the neophyte eye so does the ease in which they create and transform airy clouds of fleece into yarn. They will not be submitting plyed yarn for measurement because plying is done after dyeing the skeins. We occasionally dye fleece during Club if we lack skeins. 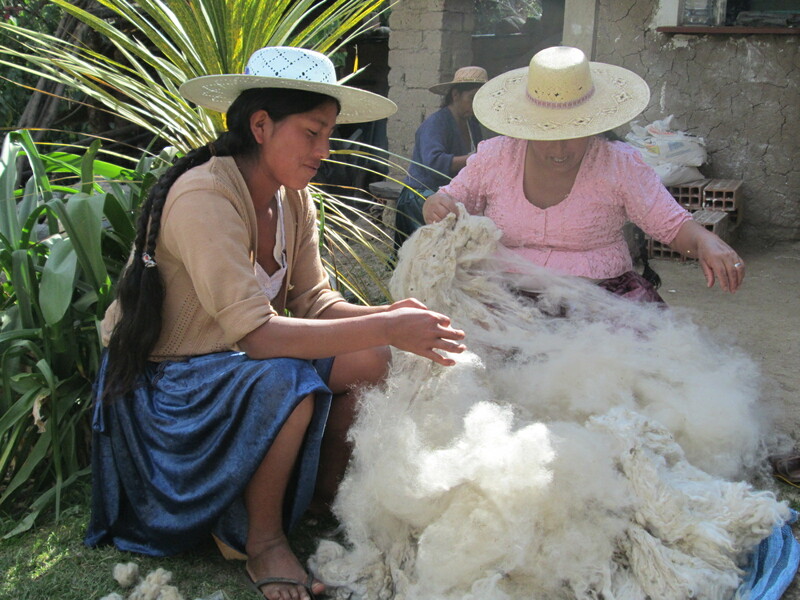 Doña Máxima informed me that the Club members signed up for Spinzilla will not be spinning the alpaca fiber we purchased in January, although they are preparing it for spinning for future knitting projects. She said it´s slippery and doesn´t spin as quickly as sheep´s wool. She purchased a white fleece and a grey fleece from the local butcher that she will wash in the river, dry, shear, and prepare for spinning prior to the October competition. The grey skeins will be left natural and she will dye the white skeins for use in future weavings. The Club holds dye days when there are a plethora of dye plants available which is February through April as the rainy season winds down. a truck with a parade princess precariously balanced waving to the crowd. A teacher walks beside the floats using a long stick to prod the bird’s nests of electrical wires up and over the high points on the floats. 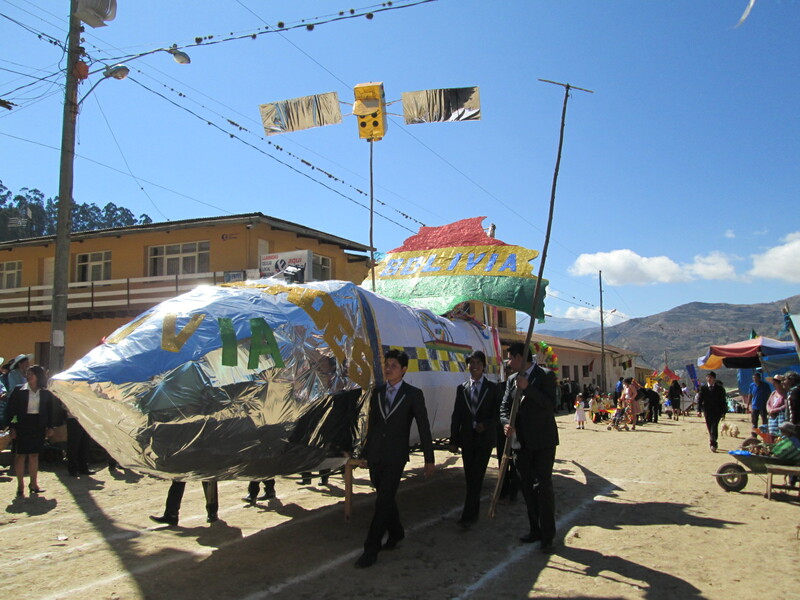 The graduating classes also compete in designing floats out of materials that can be found or purchased locally and can be carried through the streets. Thank you Nancy Meffe for your support which will be split between Spinzilla and ongoing Club de Artesanas expenses. I will be returning to Independencia tomorrow with additional funding for the medical expenses for 5 year old Joel Cachi, thanks Sherry.